The Best Western Hotel Frankfurt Airport Neu-Isenburg lies in a peaceful location in the historic town centre of Neu-Isenburg, only 9 km away from Frankfurt city centre and Frankfurt Airport. The location of our hotel is perfect for quickly accessing Frankfurt Airport or the Trade Fair and easily avoiding the metropolis’ traffic while doing so. Frankfurt inner city and Offenbach are located about 15 minutes away by car. It takes only 10 minutes to reach the Commerzbank Arena, where a number of exciting events are held. 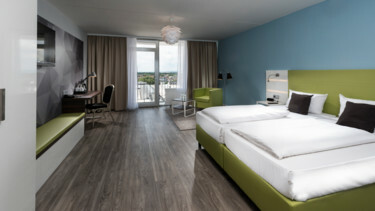 Visitors to the Trade Fair, airline crews and visitors to the city who would like to stay in a welcoming and comfortable hotel will feel right at home in Neu-Isenburg. After our renovation which was finishes on 31st July 2016, we can offer our guests modern amenities and air-conditioning in each hotel room. Besides the renovation of the rooms, our corridors and the hotel lobby were also redesign with welcoming colours. The gym moved to the first floor. That means you can do your excersises in a bright and air-filled room now. The 3 star Best Western Hotel Frankfurt Airport Neu-Isenburg is perfect for those who need a place to stay before departing from Frankfurt Airport. With our proximity to the airport and the hotel’s shuttle service, your trip will be made as easy as possible. The 24 hour shuttle can bring you to the airport in roughly 15 minutes. Please book the airport transfer at least 48 hours in advance. The hotel has its own parking lot which may be used by guests to the hotel for a fee. The panoramic view of the “Mainhatten” skyline from the restaurant on the 19th floor is particularly impressive. At the Best Western Hotel Frankfurt Airport Neu-Isenburg, we serve your breakfast in the Sky restaurant. Enjoy delicious and healthy choices from the buffet while looking over Frankfurt's skyline. In our hotel lobby you can find a station, where you get hot drinks for free and where you can buy other drinks and snacks. There is a lot to discover over the course of your stay in the area surrounding the hotel. Isenburg Shopping Centre is adjacent to the hotel and offers a wide variety of different shops. There is also a great selection of restaurants near the Best Western Hotel Frankfurt Airport Neu-Isenburg. There are plenty of outdoor activities in the nearby Stadtwld” (City Forest) for anyone who loves sport and there is always some excitingevent at the “Hugennottenhalle” in Neu-Isenburg, so that you’re sure to be entertained after a long day in the city. The Best Western Hotel Frankfurt Airport Neu-Isenburg provides spacious rooms and apartments which were recently renovated, and our modern amenities will make both holiday-makers and business travelers happy. All rooms at our hotel are at least 35 m2 and have a self-regulating air-conditioning system. These bright hotel rooms all have access to a balcony and the Sky Rooms on the 20th floor offer a breathtaking view of Frankfurt’s skyline, the Rhine-Main Airport and the Taunus mountain range. All guests to the hotel can use the Wi-Fi for free within their rooms. The apartments, with a fully-equipped kitchen, are perfect for long-term guests. There are lots of different things to do in the vicinity of the Best Western Hotel Frankfurt Airport Neu-Isenburg. Go for a walk in the beautiful Frankfurt City Forest or watch an exciting game of football at the Commerzbank Arena. Frankfurt is one of Germany’s most important trade fair cities. The IMEX, Frankfurt Book Fair and many other events attract visitors from all over the world to Frankfurt.